Another week has passed and we are back to you with our weekly update. 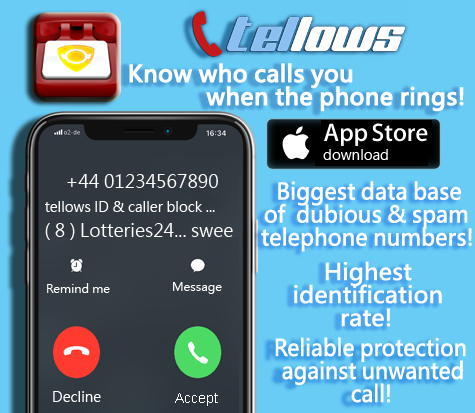 This week’s peculiarity is concerning all those annoying PPI claims companies and telemarketers with their calls and even worse is that they are refusing to remove people’s numbers from their lists – that’s the way they work. As a result, in these tough economic times, your telephone seems to ring more often and the amount of annoying or harassing phone calls from telemarketers and PPI claims companies may even double. apparently, through searching on the web, 01792455426 belongs to Liefstyle Money who call you about reclainming PPI which is very easy to do yourself and there is no reason why anyone should use a separate company ! It’s a call center working for a fund raiser. If you signed up to give money for a good cause, a third company working together with the fund raiser will call you and ask you to increase your donations. It’s no scam but can be annoying if you ignore them and don’t ask them to remove you from their records. As you can see there are many newcomers this week what means that the world of spam and scam is changing every day. New and new players are joining the game and we need your help to find them out ! Take care, friends of tellows !!! This entry was posted in Weekly Top 3 Nuisance Callers and tagged annoying, claims company, PPI claims, scam, tellows score, Top 3, top 5, weekly on Tuesday March 12th, 2013 by Kristine. Another week has passed and we are back to you with our weekly update. Scammers and spammers were very active this week and as a result we have a new Top 5 leader. 2nd place this week and the winner of the last week 01618505451 as well as owners of 3rd place 01792455426 and 4th place 01933698538 are very active telemarketers that “help you to claim your PPI” but actually don’t. Another classic scam. Our user GÄntz is also wondering how many are there ??? evers day another PPI calims company calls… how many are there? These guys hassle me every day for the past 3 months, they call at all hours to catch you off guard! They try to sell me vacant land for property development. AVOID at all costs! 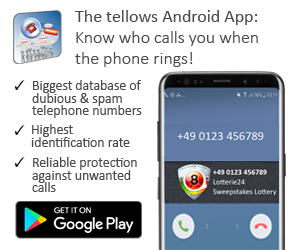 Every week spamers and scammers are getting more and more active and we really need your help, dear Tellow-users, to report the numbers that have been annoying you the most. The war is not over. And we are very thankful for every comment you leave and every number you report ! This entry was posted in Weekly Top 3 Nuisance Callers and tagged fraud, nuisance calls, PPI claims, scam numbers, spam, spam numbers, statistics, telephone numbers, tellows score, Top 3, weekly on Thursday January 31st, 2013 by Kristine. Surprise, surprise! 01484818084 is persisting on rank 1 of the British top spam numbers. Keep calling me, no one ever speaks, now on my phones “blocked number” list sends their call straight to my voice mail. Insurance, insurance, insurance. Is there anything in life they do not have an insurance for? The company number on rank 2 is apparently Van Compare Insurance or Connect Quote – or a callcentre working for both of them. Several users reported this fact after having called them and after being led to the company´s answer machine. On this week´s rank 3 we have a really ridiculous call centre. They really seem to be selling anything! Tellows users commented the following items sold by this number: air conditoning/dehumidifier, solar panels and grants, Home Safe Security and alarms as well as green energy. They rang twice man with strong Glasgow accent asking “Do you want any Gear”, plus other dirty comments. Laughed a few times and hang up. This at 10.30am. Did they call you, too? What else can you tell us about these numbers? Are there any other harassing, ridiculous or dangerous numbers trying to call you? We appreciate all useful comments on harassing phone numbers. In the name of the community: Thank you! This entry was posted in Weekly Top 3 Nuisance Callers and tagged 01484818084, annoying, claims company, insurance scam, nuisance calls, ping calls, PPI claims, scam, scam method, scam numbers, spam, spam numbers, statistics, telephone, telephone numbers, tellows score, tellows.co.uk, Top 3, weekly on Monday September 3rd, 2012 by klara. This week’s most annoying phone number 01484818084 has been searched more than 5293 times now. Beware! Several stories about what the callers are offering on this number have been reported. The range is very wide, starting off with PI claims, mortgages as well as solar pannels. This does not sound trustworthy at all. Asian person who rang me wanting my details…for a claim he reckoned i was due….was reluctant to give me any details about the company he worked for -was evasive but eventually told me that hie company was called Talk International and he worked in the CI claims department. Main principle of the scam: the caller is trying to convince people that they are owed money for an unclaimed PPI insurance. 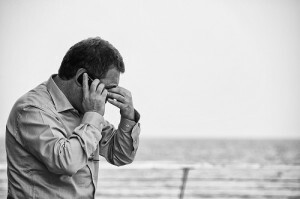 The method of the fraudulant calls is simple: assuming the called person has a loan, stating exactly how much money the person is owed by the unclaimed insurance and offering their service of getting the client’s money back – after prior payment, of course. We count on you in the struggle against phone spam and scam! This entry was posted in Weekly Top 3 Nuisance Callers and tagged annoying, claims company, feature, fraud, insurance scam, methods of fraud, nuisance calls, personal information, ping calls, PPI claims, scam, scam method, scam numbers, spam, statistics, telephone, telephone numbers, tellows score, tellows.co.uk, Top 3, weekly on Friday August 17th, 2012 by klara.